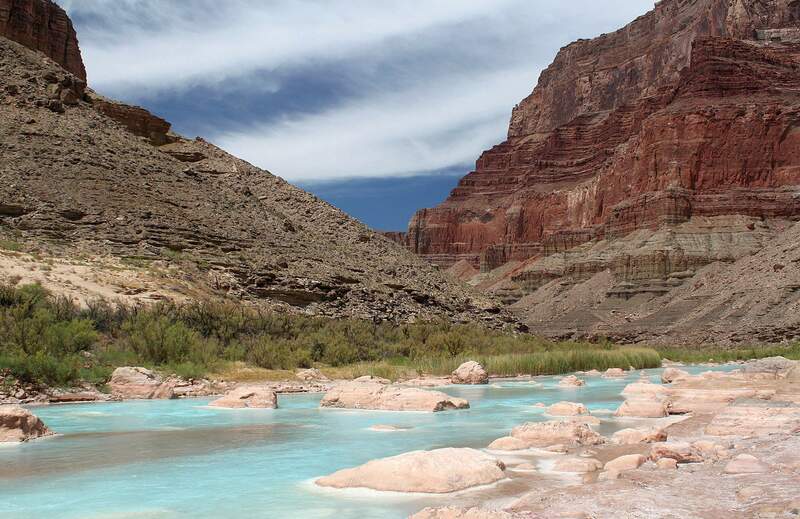 A sacred place to several Native American tribes, the confluence of the Little Colorado and the Colorado rivers is also the spot where John Wesley Powell in 1869 felt that he truly began his journey into Grand Canyon. Today, a developer is aiming to establish a tram system that could bring 4,000 visitors a day to an elevated walkway adjacent to the confluence. 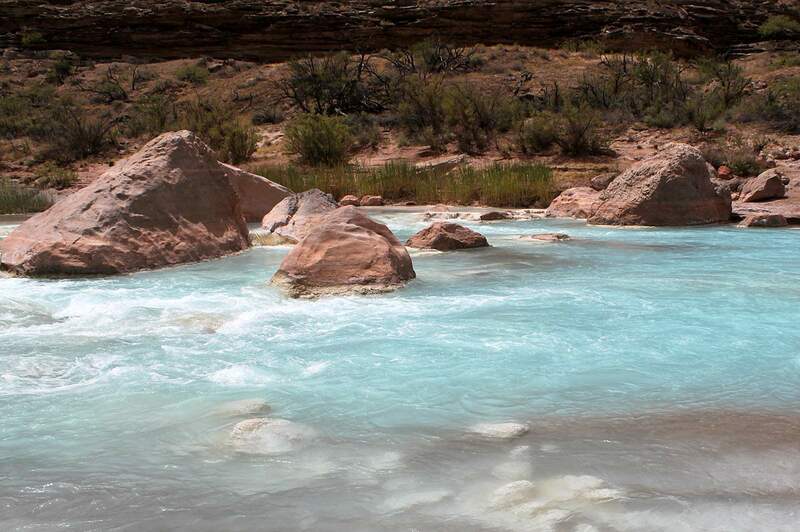 The turquoise blue waters of the Little Colorado are a stunning revelation as they mingle with the normally dark brown or green waters of the Colorado River. Thousands of river visitors each year frolic in the light blue currents. The bottom of the Grand Canyon is synonymous around the world with wilderness but now there are plans to pierce that isolation with a tram system and resort labeled The Confluence Project. One of the key issues is the location of the legal boundary between Grand Canyon National Park and the Navajo Nation. 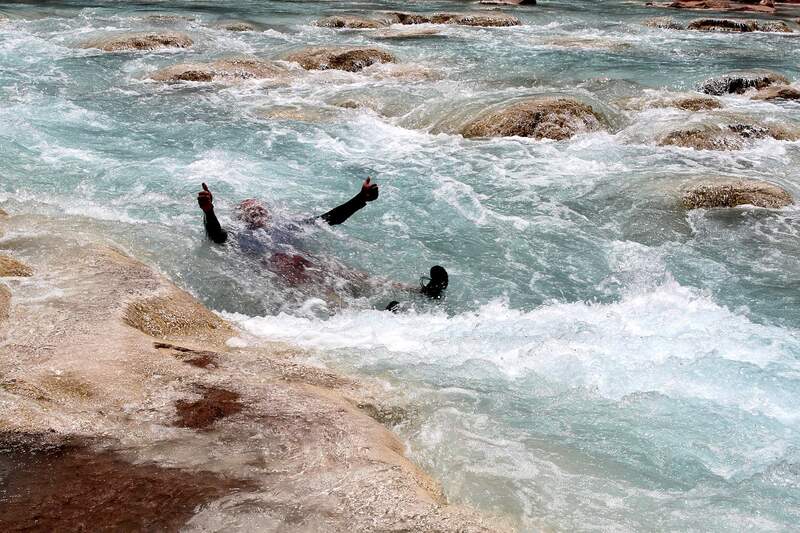 A swimmer gives the thumbs up sign as he plays like an otter in the many pools of the Little Colorado River. National Park Service staff members fear a proposed tram to the bottom of the Grand Canyon will forever alter the visitor experience of those who arrive by boat or raft. Probably the most iconic place in America, Grand Canyon is now threatened by a developer who wants to build a resort on nearby Navajo land and penetrate the canyon with a tram to the Little Colorado River. 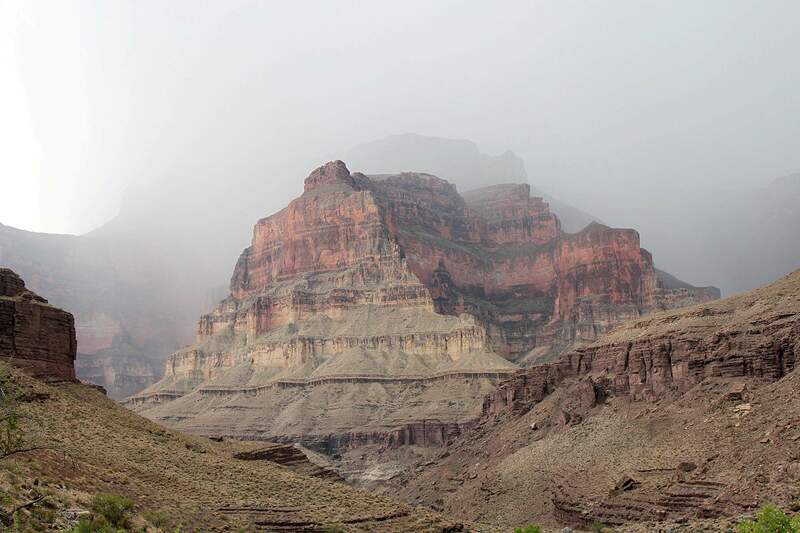 A rainstorm moves into the bottom of Grand Canyon. Another storm is brewing atop the canyon as a developer plans to build a tram system down into the heart of the canyon at the confluence of the Little Colorado and the Colorado Rivers. 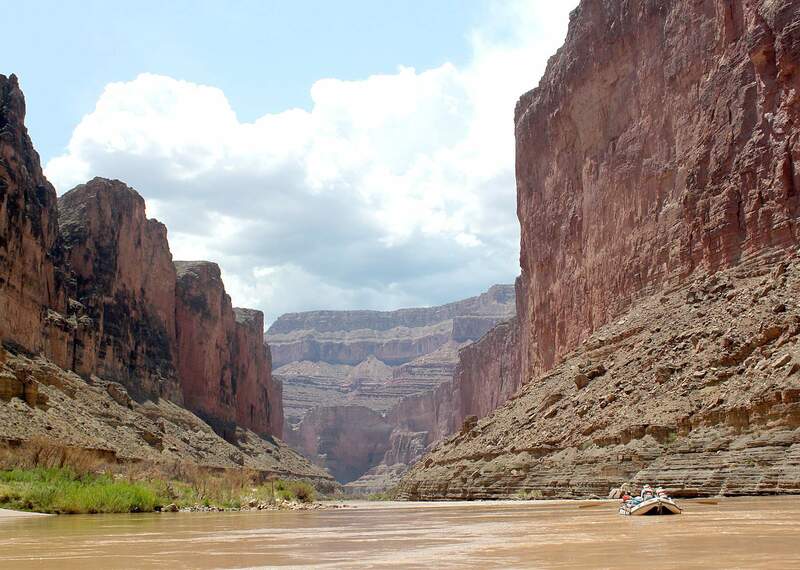 On previous raft trips down the Grand Canyon, I had seen summer rains bring roiling muddy water from the Little Colorado into the deep green of the Colorado River and dramatically change it to a silt brown color. This June was different. We tied off our rafts at the confluence and walked upstream beside the most beautiful turquoise water I had ever seen. Sky blue, tranquil, the confluence is like a desert mirage. Now this sacred place in the depths of the canyon is threatened by a proposed tram from the top that will shatter the solitude and intrude where no mechanical system belongs. The Grand Canyon is under siege. Of all landscapes in the American West, the Grand Canyon is the most iconic, representing wilderness and raw, unfettered nature shaped by the deep time of untold millions of years. The canyon is a major tourist destination for world travelers, and our perceptions of the value of the Grand Canyon have evolved as we have as a nation. A common belief is that the 277-mile-long canyon with its 1.7 billion-year-old rock is unchangeable and inviolate, but no longer. On the far western side, the Walapai have built their expensive skywalk over the edge. Visitors board tourist coaches in Las Vegas and are shuttled out to walk upon a glass bridge. Shoes and cameras are not permitted. Tourists wear paper booties. Because of its shape, river guides have dubbed the skywalk “the toilet seat.” After a few minutes of intense vertigo, tourists can then be helicoptered to the bottom for a brief raft trip with Native American guides. Tourists can then proudly proclaim they have “done” the Grand Canyon. The sense of humility, awe and soul-searching that come from a multi-day trip into the canyon on foot or by water never occurs. A Grand Canyon visit has now become just one more check-off on a bucket list with no nights under stars or camaraderie among fellow hikers or river runners. The economic success of the Walapai to the west has not been lost on Navajo officials to the east whose reservation border also parallels Grand Canyon. Trekkers and river passengers can ignore the carnival atop the rim, but the new Grand Canyon Escalade proposal penetrates to the heart of the Grand Canyon at the confluence. Where Hopi, Zuni, other Pueblo tribes and even many Navajo themselves, see sacred space, a Scottsdale, Arizona, developer sees only dollars. The Confluence Project seeks to build a 1.4 mile tramway descending 3,200 feet off the rim to a restaurant and amphitheater on a rocky ledge overlooking the Little Colorado. Gondola cars could bring 4,000 visitors a day who would stroll an elevated walkway. Undoubtedly, hundreds of visitors will want to play in the Mediterranean blue waters of the Little Colorado where river runners now play themselves, but they arrive and depart by water. Immersion in those turquoise waters is part of a longer, multi-day wilderness experience away from the fast-paced mania of modern society. The Grand Canyon Escalade would bring to the canyon exactly what does not belong. We’ve been here before. 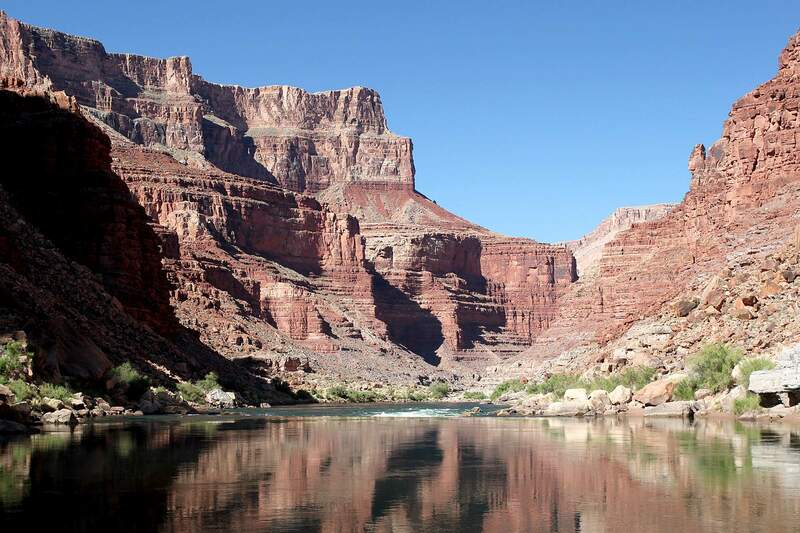 In the 1960s plans to build dams inside the canyon and to flood portions of it included the rationale that in motorboats more people could see the Grand Canyon. David Brower of the Sierra Club countered: “Should we also flood the Sistine Chapel to get closer to the ceiling?” Under intense political pressure, the Bureau of Reclamation backed down, and environmentalists claimed a major victory. This time it is not eco-advocates rallying the conservation community against a federal bureaucracy. This time it is a private developer exploiting an impoverished Native American tribe because of a loophole half as large as the Grand Canyon itself. Where’s the property line? How much of the canyon’s bottom do Native Americans own? My hero, Theodore Roosevelt, first protected Grand Canyon by designating 800,000 acres of it as a national monument in 1908. 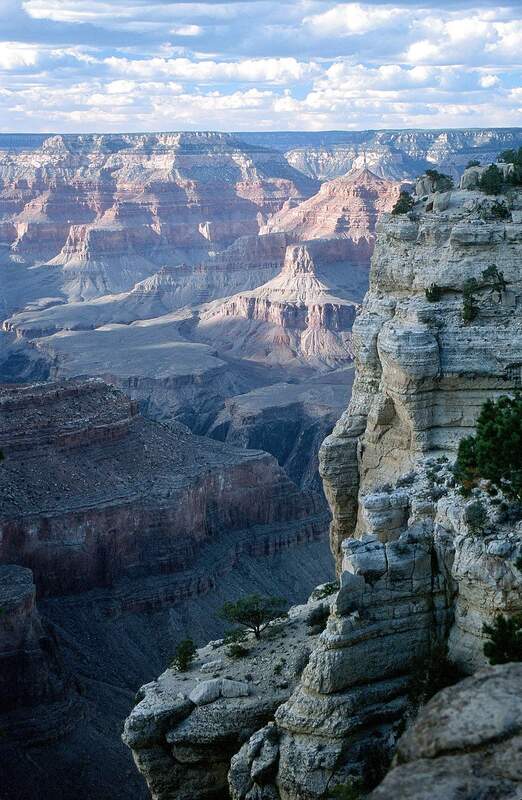 Congress created Grand Canyon National Park in 1919. It was expanded in 1974 with an enlargement act that moved the boundaries to include all of Marble Canyon to Lees Ferry, but no firm property line was established at the river, and the Navajo Nation is a sovereign entity. Does the tribal reservation extend to the middle of the Colorado River? Does it go to the high water line? Or does it begin one-quarter mile back from the river’s edge as the Bureau of Reclamation argued during its dam building era? To complicate things, Bureau of Indian Affairs Commissioner Robert Bennett enacted the Bennett Freeze in 1966 because of ongoing land disputes between Navajos and Hopis. No development of any kind occurred on 1.5 million acres of the reservation where 20,000 people live. “Residents couldn’t so much as repair a roof or maintain a horse corral,” explains Anne Minard in Indian Country Today. Only 3 percent of families in the area have electricity, and only 10 percent have running water. President Barack Obama eliminated those prohibitions in 2009, and now millions of dollars are available for rehabilitation and development, but the Confluence Project hardly seems appropriate. “As Native Americans, we are taught to respect the land. This is the opposite,” says Julyn Yazzie from the Bodaway Chapter near Cameron, Arizona. “I’ve been to the confluence. Taking that special natural place and disrupting it with development makes no sense,” argues American Rivers Chief Executive Officer Bob Irvin. “The Colorado River and the Grand Canyon are a symbol of what we do best in this country, and the confluence is an iconic and sacred place important to all Americans.” He add that this is why American Rivers and the Grand Canyon Trust will be working with Navajo leaders on alternatives.